I am the operations dementia manager for Balhousie Care Group, overseeing and designing dementia services across all 25 of Balhousie care homes. The role is varied and ranges from supporting our two dementia facilitators, designing and delivering training in dementia and linking this to the Promoting Excellence in Dementia Care framework for Scotland, to auditing services using a range of tools including dementia care mapping, dementia strategy-based audits and the Balhousie observational assessment tool. I also lead the Balhousie dementia ambassador programme. The main themes of the programme this year are to continue to reduce and monitor the use of antipsychotic medication, support cognitive stimulation therapy groups, support the further development of Namaste care for people with advanced dementia and ensure there is access to a therapeutic garden space for all. I started my career in care homes at the age of 19. I was struck by the difference in care and choice given to people with dementia and decided I wanted to work in care homes and make a difference. Dementia care since then has come a long way and this has only been possible with everyone working together to drive change. I love talking with and getting to know people. When talking about person-centred care, I often say: ‘Get to know the person and you will get to know what works for them.’ I also enjoy seeing people grow in confidence and celebrating with them when they achieve their goals. I have developed my leadership skills over the years working in care homes, learning from some of the best and have formal qualifications in management and leadership. However, I cannot highlight enough the benefits of developing good communication skills and learning from observing practice. I am inspired daily by the innovation and dedication of nursing and care teams in care homes. I enjoy reading and exploring Scotland. Winning the RCNi Leadership Award in 2018 and seeing the growth of the Balhousie dementia ambassador programme. 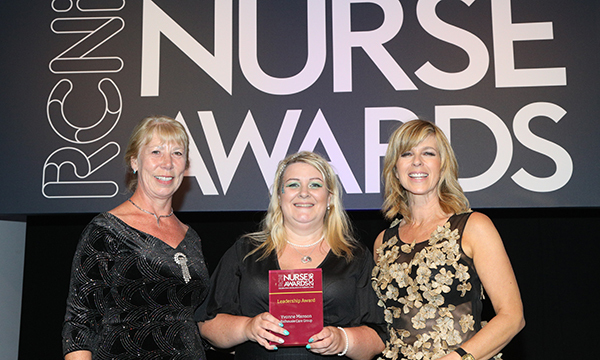 What did your win at the RCNi Nurse Awards mean to you? It was overwhelming. Having spent my career in care homes and faced a lot of career stigma for choosing this division, to be nominated by your peers was a career high. Afterwards, I received various messages and stories from other care home nurses who were inspired to follow their goals in the sector; this was the best part. Someone who inspires and supports others to grow and learn. One of the best things about being a leader is seeing and supporting people to gain confidence and achieve their own goals. If you go out each day to do a job you love, you’re already a success. It took me 20 years in the care home sector to land what is my dream job and, with each post, I learned new skills. Don’t ever give up: keep learning and adding to your skills.